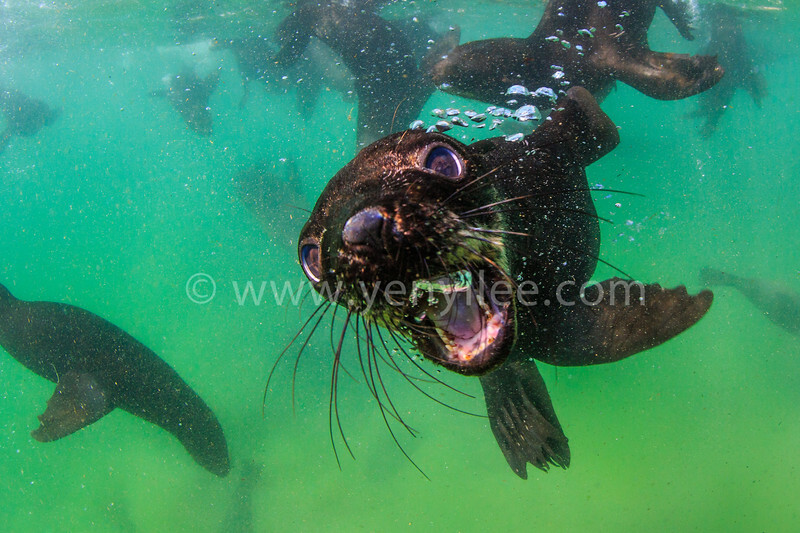 A very playful and curious South African fur seal rushed into my camera and made a lot of bubbles. South African fur seals are ballet dancers in the water, porpoising alongside boats and bobbing up to gaze at you with enormous eyes. They’re playful and will sometimes interact with divers and snorkellers. There are around two million seals on South African and Namibian shores. It’s a staggering comeback for species that was thoroughly decimated a century ago. Since sealing has stopped in South Africa, things have turned around completely for the fur seals. They used to be limited to breeding on islands to avoid land-based predators. But humans have caused the numbers of these predators to drop and now seals are breeding on the mainland, which has led to a dramatic population growth.